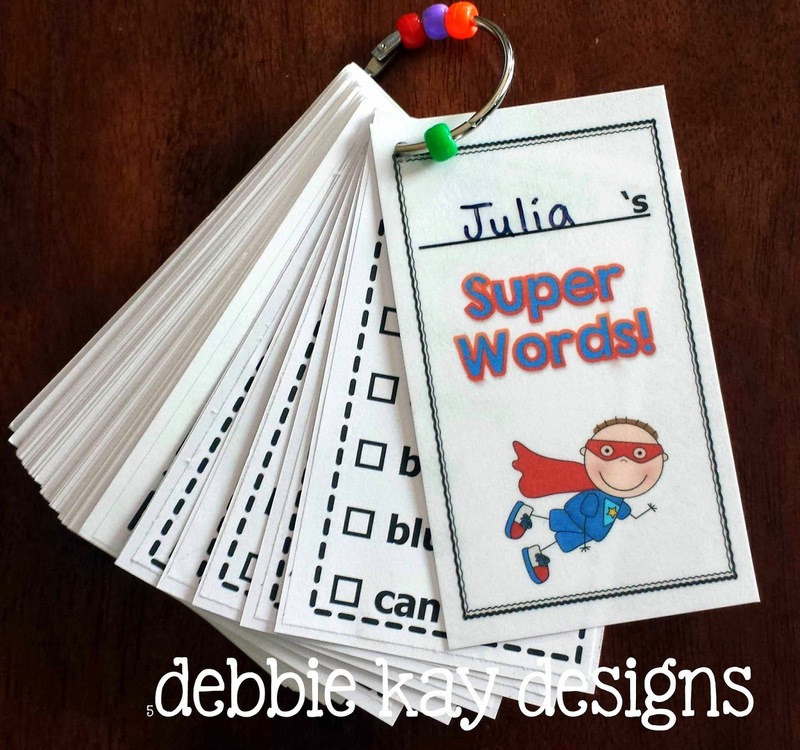 debbie kay designs: It's time for... Super Words!!!! THIS is it! My favorite resource that I have ever created for my classroom. Super Words! 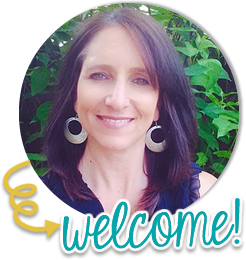 I love it so much that this is the reason I decided to open a TPT store to share it with others. Beads!! Who'd have thought that giving my students a bead to put on their flashcards ring would be such a HUGE incentive! Here's how I use my Super Words! resource in my classroom. Each week my students get a new flashcard to put on their ring with 6-7 new sight words to learn. Flashcards are printed out and pre-cut by me. They quickly use a glue stick to adhere to an index card. I hole punch it and they put the new card on their ring. This only takes 5 minutes once they have the routine. These go home with the students with their "baggie books" for nightly practice. They also use them during reading time during Daily 5 in the classroom. And, of course, I put the new Super Words on our word wall to practice throughout the week. Every 4-5 weeks, usually at mid-term, I assess my students. I DO NOT let them read the words off their flashcards. 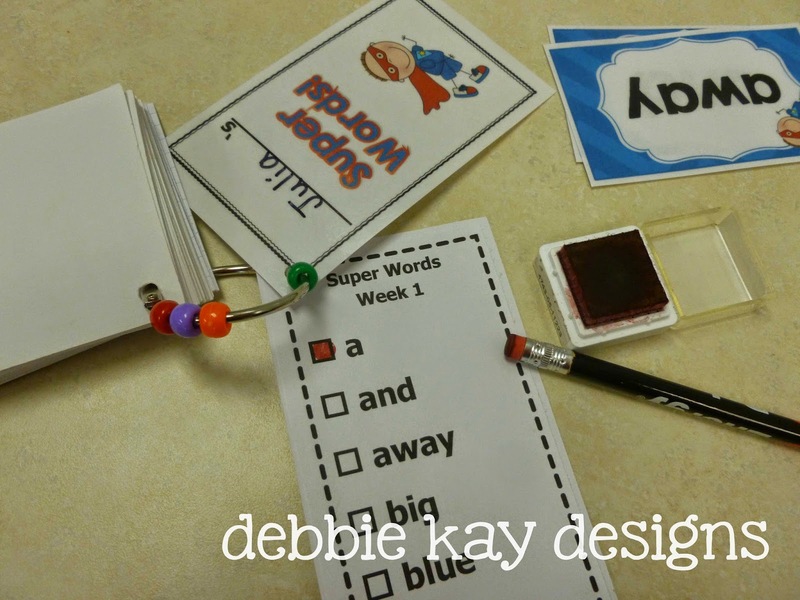 (Some students will memorize the words in order...) I use my Super Words Sight Words Cards, mixed up, to assess (shown above). If a student knows all the words, I stamp the check boxes on their flashcards, indicating words they've mastered. I use the eraser from a brand new pencil as my rubber stamp. 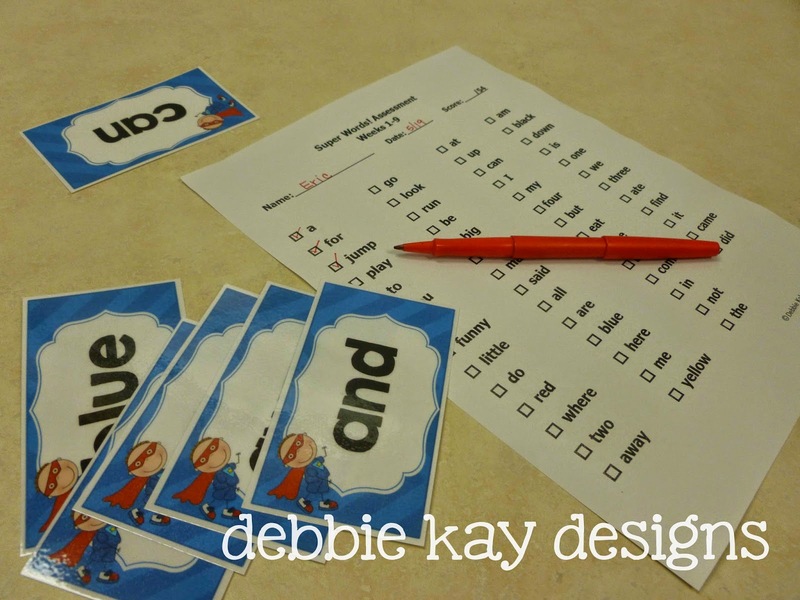 (See pic below...) You could also hole punch, or use a marker to check off the words. **UPDATE 6/7/18: I now assess my students on their Super Words using the SEESAW app. I upload each assessment into the app and students take the assessment independently. 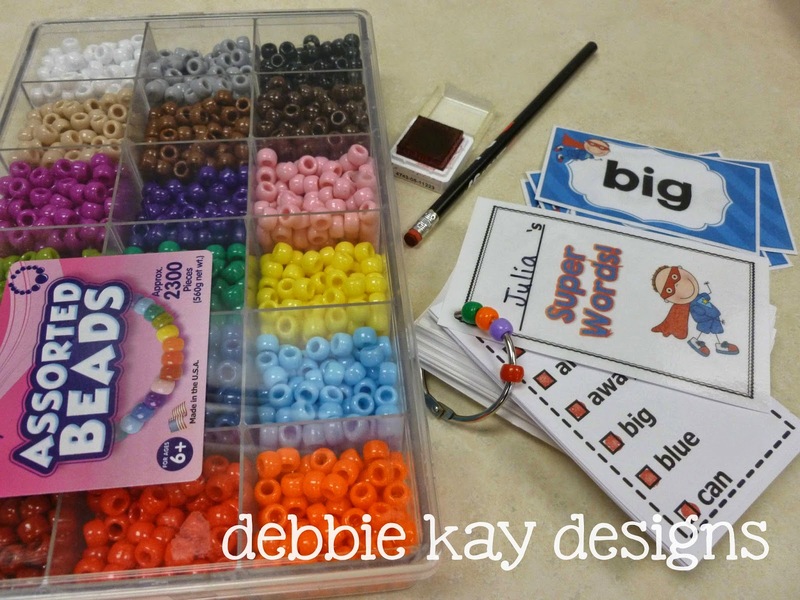 To see this resource in my TPT shop, CLICK HERE. Then, this is when the magic happens. They earn a new bead to put on their flashcard ring. Stop the world! You cannot believe HOW EXCITED your students will be about this! I'm telling you! I talk it up real big at the beginning of the year and make a huge deal out of it. I keep the color a secret and they get so excited when I reveal which color they'll be receiving each time. MAGIC! I can't believe how hard they work to earn those little beads. You might be wondering, what happens if a student doesn't know all the words when assessed. No problem. I simply tell them they did awesome, here's a couple of words you missed and need to work on, and I'll test you again in a few days. 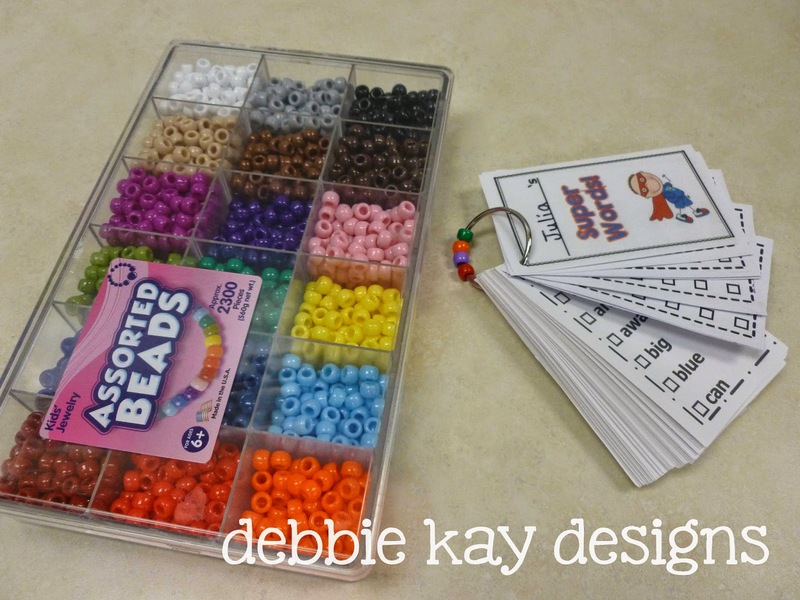 Students can work at their own pace and everyone has the opportunity to earn all the beads. As I said, I test every 4-5 weeks. Our school runs on a 9-week quarter, so that is how I set this up. By the end of each year, my students earn a total of 8 beads. Plus, a bonus bead if they take my Super Words Challenge. More on that in a second... If your school doesn't have 4 quarters like we do, no problem, you can still use this. I have 36 weeks of words, simply break it up however you wish. My Super Words Challenge is one final, huge 220-word assessment that I do at the end of the school year. I have parents test their kids on all the Super Words first, and when they are ready, I test their student. If the student can read all 220 sight words, they earn a special certificate of accomplishment. They get super-proud about this! Let me tell you how successful my students have been with Super Words! I'd say 98% of my students have earned all 8 beads and an equal amount have taken my Super Words Challenge and passed. Woo Hoo! I truly believe my students' success with this program has made them better readers. 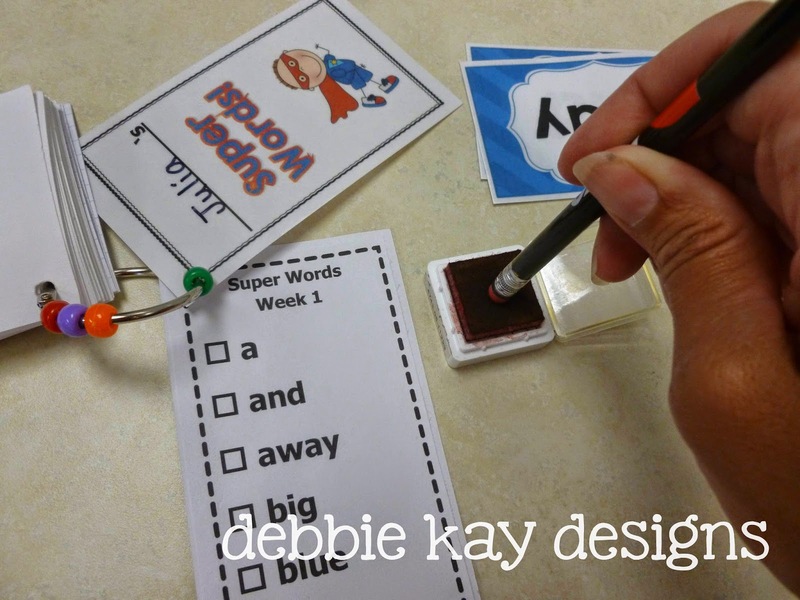 If you're looking for a fun new idea to help you teach sight words, give this a try this school year. My Super Words Flashcard Ring comes with 36 weeks of flashcards, 4 quarterly assessments (which can be used to do a year-end assessment also), and a Super Words Challenge certificate. Download a copy in my TPT store here. I also created some additional resources that I use in my classroom. You might find some of these helpful as well. Thanks for your interest in learning more about Super Words! If you have any questions, please let me know.